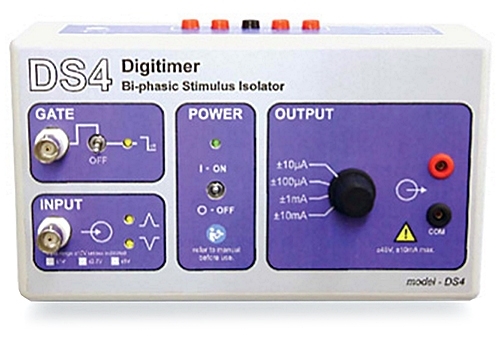 Deliver positive AND negative current stimuli. The DS4 takes an analogue voltage waveform defined within your own data acquisition/ control system and converts it into an isolated constant current stimulus. The DS4 will accept several input voltage ranges and produces four output ranges (±10µA, ±100µA, ±1mA and ±10mA). It also features a GATE input, so that several DS4 units can be controlled by a single analogue waveform, but enabled individually via this GATE input. A timed “inactivity sensor” reduces battery usage and damaging “leak currents” during infrequent stimulation, while at the same time maintaining low levels of zero crossing distortion for repetitive waveforms. Included external power supply (input voltage 110V – 220V) providing ±15V DC output. 10 x 12V GP23A Batteries. One or two stimulators may be mounted in a 19″ rack using a specially fabricated frame (model D121-11) available from Digitimer Ltd.